I must have passed the Pittsford Farms Dairy hundreds of times over the years, and never stopped in. I’m not sure why – I've heard raves about the nonfat milk that tastes like it’s full of fat. And I had enjoyed a superlative cup of hot chocolate Java’s Cafe on Gibbs Street, and learned that it was steamed chocolate milk from the dairy. Last week, my son and I were in the neighborhood and saw a sign for “ice cream parlor open,” so we finally visited. What a quaint place! I loved the old-fashioned red building that housed the ice cream shop, complete with chandeliers made from milk bottles. I was told that all of the ice cream is made fresh at the dairy, which was impressive. The line was fairly long but moved along quickly. As we waited, we eyed a tempting assortment of pastries, but we used our will power to resist purchasing some. My son was happy with his mint milk shake. 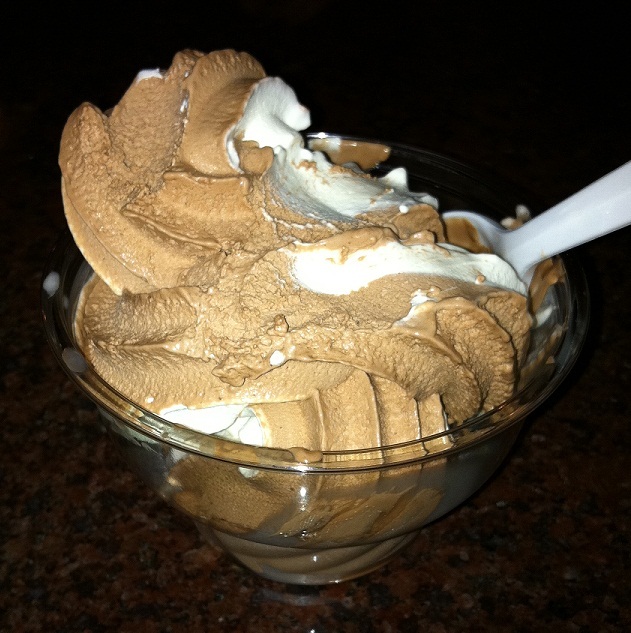 The texture of my twist frozen custard reminded me more of meringue than a dense, creamy frozen custard. The vanilla side wasn’t sweet enough for me and the chocolate side didn’t have a real chocolate punch (which is surprising, given their outstanding chocolate milk). I enjoyed my visit to Pittsford Farms Dairy, but the next time I’m in the neighborhood for ice cream, I’ll opt for of their hand-dipped flavors. Does anyone have a favorite to suggest? Is it CSA Time Yet?